Steven (Chicagoland, United States) on 11 April 2019 in Plant & Nature and Portfolio. Jens Jensen, who designed the Garfield Park Conservatory in 1906, wanted to give visitors a glimpse of what Illinois might have looked like millions of years ago. 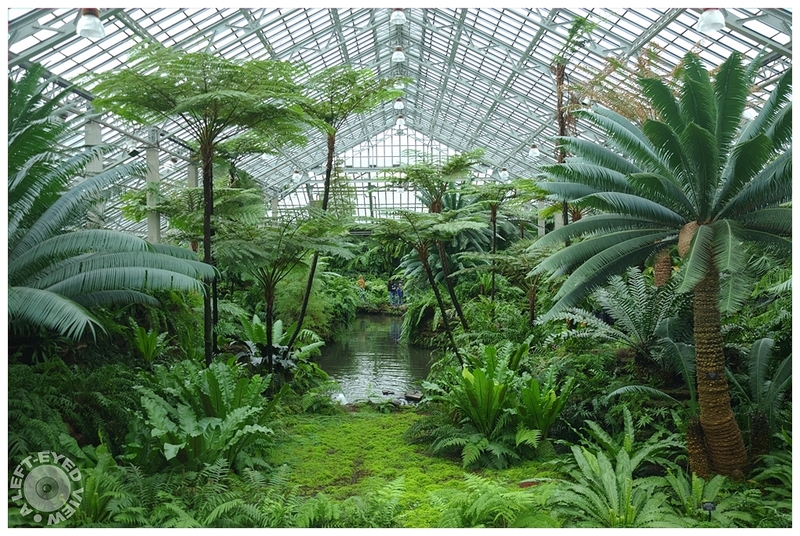 Lush ferns, rocky outcroppings and an indoor lagoon evoke the swampy landscape of prehistoric Chicago. The Fern Room is home to the cycads: ancient cone-bearing plants, ferns and fern allies (plants that thrive in similar conditions and emerged around the same time as ferns, like mosses and liverworts). Many of these plants are considered primitive plants, or members of plant groups that grew during the age of the dinosaurs, about 300 million years ago. As a magnificent tropical forest. Tous ces différents verts sont superbes. Belleza de imagen, con sugerencia de un maravilloso edén. ***** Saludos. Excellent green . A real tropical scene. Very nice capture. I love that king of place, I could almost feel the mositure around it! A luscious and lush view of these greens which were imagined by the creator. Fantastic image...A little prehistoric created here..what with lagoons and all!! Nice composition of the plants with the water in the middle. Feel me middle to the jungle and expect to see a monkey every moment. Un endroit fantastique . Merci de nous partager. I was just reading an article about what parts of country looked like when the dinosaurs were living. This really brings it into reality! A gorgeous view with such lush plants! Interesting words to accompany a magnificent image. My first thought, at seeing this, is that it looked like a swamp. After reading the description, it has to be an ancient swamp. Gorgeous image. The pond is so inviting. De la chlorophylle à foison... C'est magnifique ! This year is very tropical looking. I’m impressed with how nice the picture is. it’s an excellent shot. An authentic enchanted world, where the green reigns. My soul swoons at the plush viridity of this lovely photo! How innovative he was! This is so wonderful - than you, Steven!